Camping trips are always a great deal of fun for you, a group or the entire family. But there is a lot of planning that goes in to the trip before it ever begins. That’s why the camping checklist template from Microsoft is an excellent tool. With the Microsoft camping checklist, you can map out your trip before you hit the road. You’re going to be spending enough money on food and other supplies for your camping adventure. That’s why the camping checklist template from Microsoft can be downloaded absolutely free! Simply click the link featured on this page to get started. 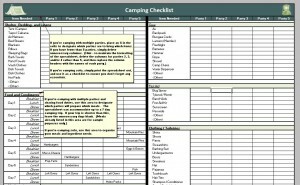 The camping checklist comes in the form of a thorough and extremely detailed Microsoft Excel template. The camping checklist is formatted to cover everything you need on a trip, but you can add or remove items as you see fit. The template is customizable and can be changed to meet all of your needs. Once the item has been purchased or if you don’t feel you require the item, simply mark it off the camping checklist. As formatted, the camping checklist holds space for up to 5 different parties that could be making the trek. Start your next camping adventure off the right way with the camping checklist template from Microsoft. You can download and print the Microsoft camping checklist template absolutely free today!